Today my dad and stepmum Ann were supposed to be coming over for Sunday dinner, however mechanical problems with the old jalopy meant that they had to cancel. I had prepared a fantastic menu of roasted tenderloin of pork with sweet potato mash and the usual suspects that grace the Sunday dinner plate. For dessert I planned on serving up rhubarb meringue pie, courtesy of a recipe that Nicola had found on Marks & Spencer's blog. Despite the setback, the recipe for the pie looked fairly straightforward so I pressed ahead and made it anyway and I'm so glad that i did because today's pudding was delicious. Line an 8 inch flan dish with the pastry, prick with a fork, line with greaseproof and fill with baking beans. Blind bake for 15mins in a preheated oven at 180C (fan assisted, slightly higher if not fan assisted) before removing the paper and beans. Bake for a further 5 minutes to lightly brown. Set aside. Turn the oven down to 160C. Put the rhubarb, sugar and orange zest in a saucepan. Cook for about ten minutes until the rhubarb starts to soften. Strain through a sieve to remove any excess juice. Whisk the egg whites in a clean bowl until they form stiff peaks. Gradually add the caster sugar, whisking well between additions. Add the rhubarb to the pastry case then top with the meringue mix. 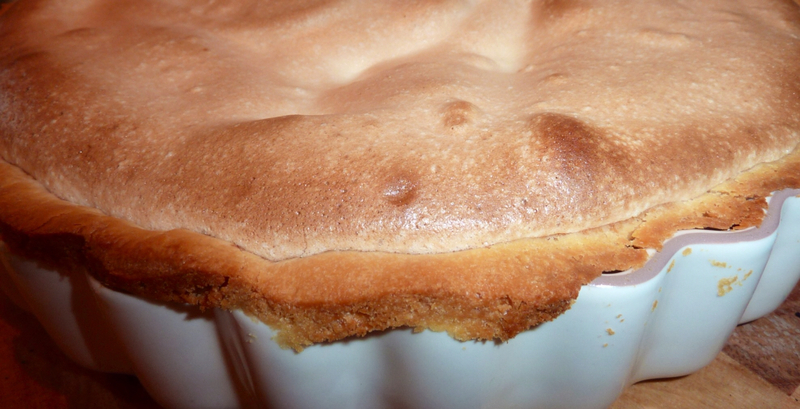 Bake in the oven for about 20 minutes until the meringue is golden brown in colour. Serve with fresh custard or double cream. The flavour of the orange zest works incredibly well with the sharpness of the rhubarb, while the sweet meringue helps gives a great balance of sweet and sharp. 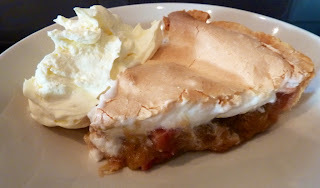 I always try to make as much use of rhubarb as I can when it's available and because this recipe is so easy to follow, I know that I'll be making it again soon. Of course, because I didn't have my expected dinner guests, I won't be baking again soon as I still have plenty of this pie left.